Removing wipes, rags, plastics, hair and other stringy material at the headworks of a WWTP is very important. A traditional ¼” (6.0mm) screen will remove some of this material but as any operator knows a lot will still pass through a ¼” (6.0mm) screen and will form “mats” (clumps of rags, hair, wipes etc) that will bind pumps and other rotating equipment in the plant. This results in high maintenance costs, and the unpleasant and difficult work required to remove these mats and repair damaged equipment. 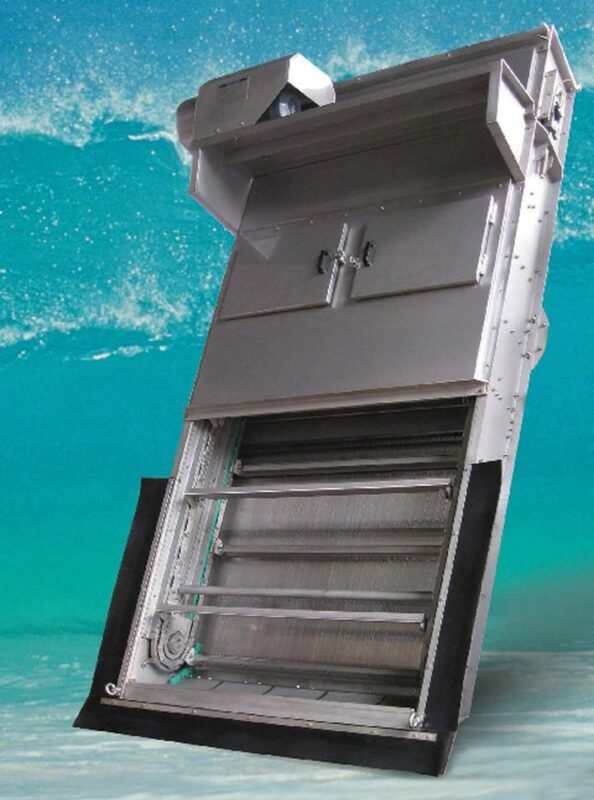 Due to its unique non-clogging design, the Blue Whale unit is also excellent for screening industrial, food processing or municipal wastewater with high fats, oils, and grease levels (FOG). These high concentration FOG wastes are very difficult to screen and blind most screens. The OR-TEC Blue Whale screen can operate in these types of waste with as low as a 1mm openings protecting pumps and valves by removing this scum while remaining open and clog free. The superfine (1~5mm opening) mechanical bar screen is suitable for the headworks of both municipal and industrial wastewater treatment plants with over 1,500 units in operation− including over twenty in U.S. Military Bases in South Korea. The screens are manufactured in an ISO 9001 US manufacturing and ISO 14001 environmental standards factory. Unlike typical bar screens that use flat bar, which makes the openings between the bars prone to clogging, the Micro Bar Screen uses a parallel array of wedge-sectioned bars (not wedge-wire) with even spaces to form the screen face. Wedge-sectioned screen bars have only 2 contact points on which material can block, as the path from the screen face to the back of the screen is gradually enlarged. Solids which passed through the two contact points cannot become clogged between the wedge shaped bars. 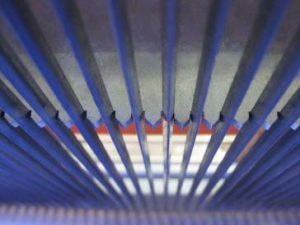 A cleaning rake with slotted teeth penetrates well past the opening on the wedge bars−cleaning the screen array and thereby completely preventing clogging or blinding of the screen. It is typically located in the influent wastewater channel at about a 75°angle. The water flows through the openings between the screen bars while the solids are captured on the upstream side of the screen bars. Captured solids are lifted up to the top of the screen by the travelling rakes, whose penetrating teeth fully clean the openings between the screen bars. These screenings are discharged by a scraper mechanism to a receptacle for disposal or to an OR-TEC Compactor Washer. This process is mechanically reliable and repeatable, as the entire rake enters cleanly and keeps going timeafter-time. The screen is environmentally efficient as no washwater is needed to keep the screen openings clean−resulting in huge savings in water and electrical usage. Another unique feature of the OR-TEC Blue Whale Screen is its ability to be installed vertically. This allows the unit to operate in applications with deep inverts where an inclined screen will not fit. The vertical screen can also be installed in wet wells and pumping stations to protect pumps. 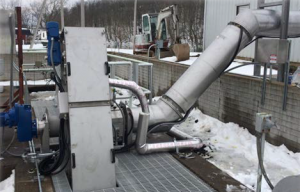 Servicing a municipality of approximately 6,300 customers, the plant was experiencing problems with trash rack bar screens that had 2” gaps which resulted in a deluge of rags in the plant−resulting in the pumps having to be pulled and cleaned monthly. Having researched screen system options via visiting a number of different installations, Ken Mann, Rittman WWTP’s Utility Director, discovered OR-TEC’s Blue Whale at an industry trade show featuring a 3.0mm opening and 2.0 mgd flow/set. 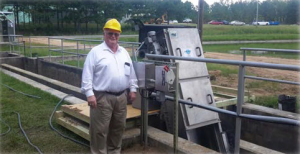 With a population of 4,226, the historic small town of Hazlehurst, GA’s Mayor Bayne Stone was looking to replace an old screen that left their WWTP infiltrated with debris materials, which resulted in major plant shutdowns for cleaning. 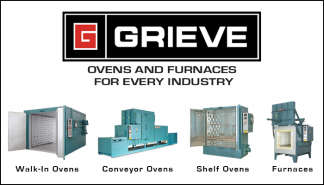 With plans to rebuild the plant in 2017 and a goal of keeping it clean, Stone sought out a solution to the problem at an industry tradeshow. He was provided with a detailed demonstration of OR-TEC’s Blue Whale micro bar screen system featuring a 2.0mm opening and 4 mgd flow/set. The industrial wastewater system for the production of a leading national brand of Cat Food products in Arizona handles a lot of cooked meat products that produce thick, oily run-off with FOG residual debris. OR-TEC provided a self-cleaning, Blue Whale micro bar screen featuring a 1.0mm opening and 0.1 mgd flow/set− processing 50 gpm at 28,000 parts per million TSS, which is mainly FOG. Regardless of the end-use capacity requirement profile, OR-TEC focuses on detailed customization to optimize wastewater treatment needs every step of the way−providing a one-stop service source for the entire life of the system. All OR-TEC’s products are competitively priced and comprehensively backed by a customer service support system that is unparalleled in the industry. 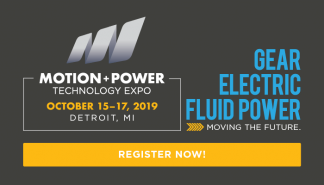 Since 1980, OR-TEC has specialized in the integrated manufacture and sales of advanced wastewater treatment equipment for the municipal and industrial marketplace−spanning the U.S., Mexico, Canada, and internationally. The ORTEC team is dedicated to delivering one of the most advanced, reliable product portfolios on the market−featuring a complete line of high quality sludge dewatering, chemical dosing, floatation, screening, and conveying equipment. Innovation, customer-focused service, and site specific customization are the cornerstones that OR-TEC continues to build its reputation upon.